I hope you’re having a fun summer so far! Mine kicked off with Kaleidoscope Art Camp at Lenn Park, a program I coordinate for Culpeper County Parks & Recreation Department. It’s become a summer tradition for my whole family. Tony and I have taught at camp, and Cole and Joy have been campers and volunteers. I’m very proud of the fact that I’ve had campers age out of the program and return as volunteers, and we’ve had a volunteer leave for college and return as a teacher for the past 2 years. This year we had our first junior volunteer, Beckett, who aged out of the morning program and came back to help in the morning and then attend as a camper in the afternoon. Beckett did a great job, and it makes my job easier to have volunteers who are past campers because they really understand what the program is all about. I’m so grateful to everyone who pitches in to make Kaleidoscope such a fun week for the campers, volunteers, and teachers. 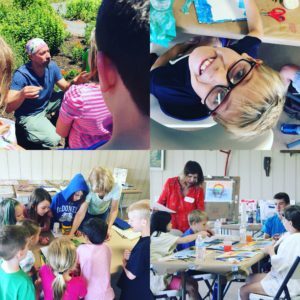 We are offering 3 Art Jam programs this summer. Our Summer Sketchbooks has already begun, and we’ve made sketchbooks together and experimented with bleeding tissue paper and liquid watercolor. Next month, we’ll have a Zentangle workshop for kids and one for adults. This is a great opportunity to come and make something fun and beautiful. In August, Making Marks returns on a new day, and there are just a few spots left.